3. Housing Wrench, Tubing, Spout, Faucet Diverter, Accessories. See BEFORE & AFTER of Carbon Block Performance Here. This is our second most advanced system with Anti-Radiation Technology, but it does not have the Fluoride Reduction Capability like our Ultra System. If you want a superior system without fluoride reduction, then consider this model. The system also features a built-in flow regulator (a commonly overlooked feature) to ensure the water's not passing through the system too quickly, this in turn provides optimal contact time with filtration media and more effective contaminant absorption. PHASE 1: (Chemicals & Sediment) The 1st clear-blue/purple chamber which the water enters features our latest innovation, The SuperBlockTM , a 0.5 Micron Carbon block consisting of not 1, but 2 different types of Catalytic-Grade Activated Carbon, yielding the micro, macro and meso pore diversity not found in the single carbon type cartridges on the market. This innovation results in our carbon block's ability to capture an unparalleled super wide-range of various chemicals, making this cartridge up-to 15x more effective than regular activated carbon blocks at removing Chloramine for example, and over 2x more potent than even some catalytic carbon blocks. It also provides nominal removal of microbial cysts and fine sediment about 100x smaller than the width of human hair, and is infused with the natural KDF55 media to discourage bacterial growth and fouling, which often happens with low-end carbon blocks. - Natural Zeolite and Calcium release trace Electrolytes & Minerals, in-turn raising pH to make water more nutritious, naturally alkaline and PH balanced. 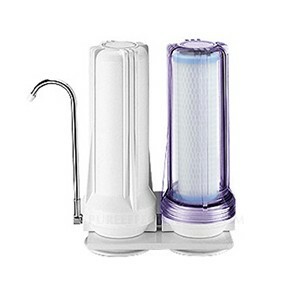 The filter unit body is NSF Certified and made of BPA-Free & Phthalate-Free, Precision-Machined, High-Strength Plastics, the Spout is Stainless Steel (non-corrosive) and all metal parts are Lead-Free. We do not cut corners on quality. By purchasing any of our products, you will also be supporting USA economy, workers and our company.